Throughout Mississippi, numerous places to catch bass peak this spring. Take a look at bass fishing prospects across Mississippi this spring. Throughout Mississippi, numerous places to catch bass peak this spring. Starting in the northeastern part of the Magnolia State, Pickwick Lake produces many 4- to 8-pound largemouths and occasional double-digit fish. Pickwick also produced the Mississippi state record smallmouth, a 7-pound, 15-ounce bruiser. Many smallies here land in the 4- to 6-pound range. Smallmouth bass spawn when water temperatures reach about 59 to 63 degrees (compared to largemouths that spawn in water temperatures ranging from 65 to 70 degrees). In addition, smallies here generally spawn a little deeper, sometimes on a shelf in the main Tennessee River channel. Largemouths prefer to spawn in shallow coves near weed beds, stumps, fallen trees or some other cover. Some of the best spring fishing on Pickwick Lake occurs in Yellow Creek, birthplace of the Tennessee-Tombigbee Waterway near where the Alabama, Tennessee and Mississippi state lines converge. The waterway connects to Bay Springs Lake, which covers about 6,700 acres in Tishomingo and Prentiss counties. Deep and clear, Big Springs Lake produces good Kentucky spotted bass numbers. Many spots exceed 5 pounds and a few top 7 pounds, particularly in late winter and early spring. The lake also produces some double-digit largemouth, with an occasional fish breaking 11 pounds. Bay Springs can produce trophy smallmouth bass. In March, the best action usually takes place in the backs of major coves or near flats and secondary points. Piney Grove on the west side or the Five Fingers area on the east side of the lake traditionally offer excellent fishing in the spring. Anglers also catch smallies in the canal section below the lake. Although only 330 acres, Lake Lamar Bruce holds some giant bass. The state fishing lake northeast of Saltillo in Lee County has delivered some bass approaching 12 pounds. The lake hosts a tremendous panfish population, which feed fat largemouth. Lamar Bruce contains many stumps, brush piles and riprap shorelines that attract bass. However, the state did some work to further enhance bass habitat by establishing more native vegetation such as water willows. This should improve fishing. In northwestern Mississippi, most people rightfully consider the “Big Four” flood control lakes — Arkabutla, Enid, Grenada and Sardis — among the best crappie reservoirs in the nation, but these waters also produce lunker largemouth. For bass, Sardis and Enid probably rank a little higher than the other two. 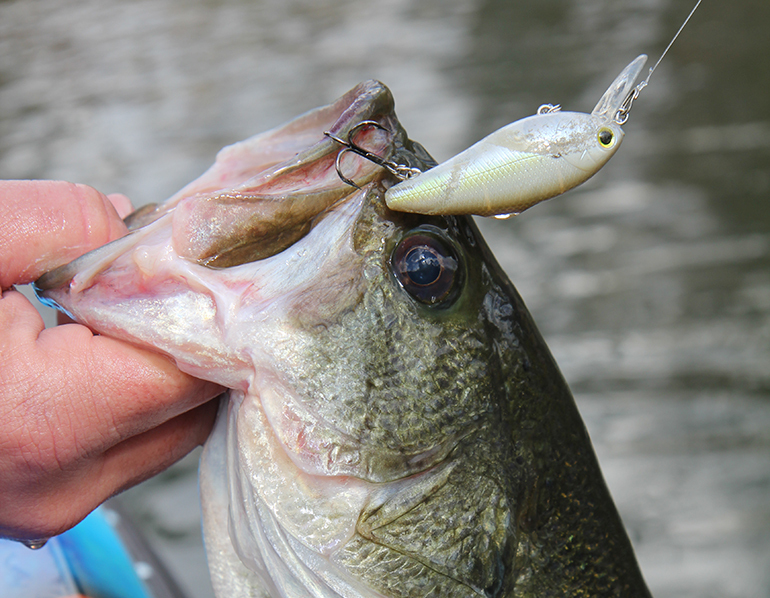 Each one holds many 5- to 7-pound bass. Sardis produced some bass close to 10 pounds. Sardis drops to more than 70 feet deep in places. Enid Lake spreads across 16,130 acres on the Yocona River. In the fall, the U.S. Army Corps of Engineers drops the water level of all four lakes. The lakes ordinarily reach winter pool by early December and begin refilling in January. They reach summer pool by early May — so anglers can expect to see rising water in March. Arkabutla Lake spreads over 11,240 acres of Tate and DeSoto counties. Grenada Lake covers 35,000 acres at pool stage near the town of Grenada. With little aquatic vegetation in these Corps lakes, many people fish the creek channels, humps, docks, old timber and shorelines. During low-water periods, vegetation that grew on the exposed lake bottom can provide excellent spawning habitat when inundated. In the spring, the Mississippi River frequently floods. Water can overflow into numerous oxbow lakes and backwaters. When a flood happens, muddy water generally messes up fishing for a while, but those waters also recharge and refresh the backwater systems. During the spring, Aycock recommended fishing Lake Ferguson inside the Mississippi River levee at Greenville in Washington County. The oxbow still connects to the main river, so the water level fluctuates throughout the year. The fertile oxbow produces good bass numbers and some lunkers. Lake Ferguson contains profuse habitat from large pilings, piers, riprap, sandbars, stump fields to flooded vegetation during high-water periods. Some sunken barges also hold fish. In central Mississippi, few lakes can compete with Ross Barnett Reservoir for bass numbers. The “Rez” covers about 33,000 acres full of incredible habitat from numerous stump fields, weeds and channel drops near Jackson. Some holes in the old Pearl River channel drop to more than 40 feet deep. Most Ross Barnett bass average about 2 pounds. However, many largemouth ranging from 4 to 6 pounds grow fat by feasting on plentiful panfish. The lake can produce bass in the 8- to 10-pound range. The spawn traditionally peaks in mid-April. Fishing should improve in coming years at Ross Barnett. In conjunction with the Pearl River Valley Water Supply District, the state began stocking Florida-strain bass in the system. In the spring, bass fingerlings are released in backwater areas with abundant vegetation to increase their survival rates. Anglers might also want to hit Neshoba County Lake. The small public fishing lake only covers about 138 acres near Philadelphia, but can produce some 9- to 10-pound Florida bass. At least one bass caught in March 2013 weighed more than 13 pounds. Another small state lake, Calling Panther Lake can also produce double-digit largemouths. The 512-acre impoundment holds many bass in the 10- to 13-pound range and produced at least one fish exceeding 15 pounds. Most of the lake averages 10 to 25 feet deep, but it drops to about 50 feet deep near the dam. Many anglers run baits along channel edges or fish the flats at the east and west sides of the lake. Anglers catching female bass laden with precious roe should release them as soon as possible to avoid overstressing the large fish. One female might spawn thousands of potential giants. One could grow up to be the fish of a lifetime for some angler, perhaps you!